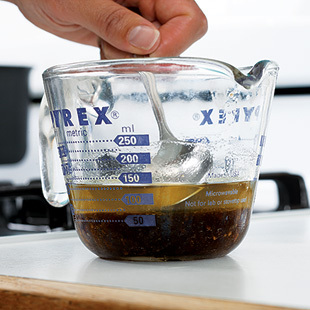 Step-by-step instructions for how to make gravy perfectly every time. Gravy is a key component of many meals, including Thanksgiving dinner. 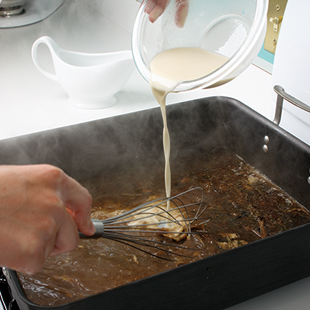 If it's not made properly, however, gravy can turn out lumpy, flavorless or full of excess fat. 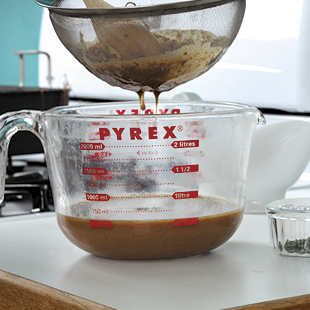 Follow our step-by-step instructions for making delicious, healthier gravy that's lump-free. After removing the turkey from the roasting pan, pour any pan juices and fat into a large glass measuring cup and place in the freezer so the fat rises to the top, about 10 minutes. Skim the fat off with a spoon and discard. Add any accumulated juices from the resting turkey to the defatted pan juices; add enough chicken broth (or other stock) so the combined liquids measure about 5 cups total. Set the roasting pan over two burners on medium-high heat. 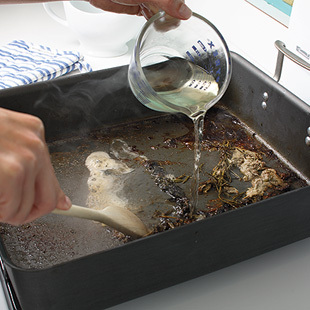 Add 3/4 cup deglazing liquid, such as white wine, vermouth or brandy; bring to a boil and cook, scraping up the browned bits from the pan, until the liquid is reduced. Add 5 cups broth or stock. Increase the heat to high and return to a boil, whisking often and scraping up any remaining browned bits. Boil until reduced to about 2 3/4 cups, 8 to 12 minutes. Combine 1/2 cup broth or stock and 1/4 cup all-purpose flour in a small bowl. Whisk the mixture into the roasting pan. Boil, whisking constantly, for 2 to 3 minutes. Remove from the heat and pour the gravy through a fine sieve into a large measuring cup. Season to taste with herbs, salt and pepper, if desired.